‘SNP furious’ could start most of your headlines on Scottish politics at the moment (5 July). 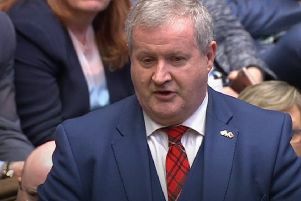 The SNP’s main complaint about the proposals for Evel is that Scottish MPs will be excluded from decisions which could affect funding to Scotland through the Barnett formula. Rather than being angry, surely they should be using this to promote replacing the current funding scheme with full fiscal autonomy as they promised their voters. As Euan McColm rightly surmises, the SNP do not want FFA to happen – their only real aim is to find excuses to form a second referendum while they still have enough momentum to have a chance of scraping past 50 per cent of the vote. None of this is making Scotland stronger. I WAS somewhat puzzled by Professor Hugh Pennington’s attempt to associate the late Professor (Sir) Neil MacCormick the former SNP MEP, with, a quotation from a 1969 collection of Essays On Scottish Nationalism edited by the latter under the title, “The Scottish Debate” (Letters, 5 July). On checking my own copy of the book, I discovered that the quotation in question – which referenced “a spate of Quisling notes” allegedly sent – presumably to Unionists – at the time, was not, in fact, written by the future law professor and SNP MEP, but by the late Robert McLaughlan, then a lecturer in modern history at Glasgow University and himself a committed Unionist in his own distinctive contribution to the book. SO DAVID Cameron is having difficulty getting other EU leaders to prioritise his ideas about how Europe should be against the refugee problem from which he has conveniently opted out, (News, 28 June). Perhaps they are being too polite to him when British governments bear such an obvious moral responsibility. Many are fleeing Syria, Iraq and Libya, all countries where the ineptitude of British foreign policy has done so much to bring about their present states of chaos. Of course, when he arrives back in London perhaps some “Ukipers” will be cheering him for keeping all those foreigners out! TOM Kitchin should know the sea trout is an endangered species on the West Coast. Thanks to estuary salmon farms and the proliferation of sea lice, the sea trout in Loch Maree are in practical extinction, falling below 15 per cent of the normal catch rate since 1985, with no large spawners being caught. The sea trout that are caught by rod and line fishermen are returned to the loch. Before 1985, the annual average catch was over 2,000 trout over one pound – under one pound they were not counted. There is always concern for the decline of sea fish, but very few people, apart from anglers, seem to have the same concern for the iconic sea trout. Please, Tom, find an alternative. RE Dani Garavelli’s column (28 June), I wish someone would explain what lasting satisfaction people get from tweeting, blogging and spending time on Facebook, etc. Personally, I would far rather receive a letter or phone call if I couldn’t meet someone face-to-face. And that is apart from all the harm that can be done, and is done through the so-called “social” media. No true exchange of views can be exercised through email or tweets, which can really only be superficial and often lead to misunderstanding. I consider myself fortunate not to be able to receive those communications and still be in touch with friends, politicians and people in all walks of life, through writing, phoning and face-to-face meetings. It also means I am spared nasty messages. This clearly reflects the very low esteem our “imposed leaders” in the EU actually have of us all – it is back to the feudal days of the barons and the peasants – and, dear reader, you know what cap arrogant Brussels will fit you with! Thus, let us keep the Common Market, but ditch the EU as soon as possible, although the question has to be: does David Cameron think along the same lines, and if not, why are we not having a referendum any time now instead of same date in the future?